HAMPI-The Glory of Vijayanagara Temples HAMPI-The Glory of Vijayanagara Temples - Shiva Maha Purana, Vishnu Purana, garuda purana, bhavishya purana, skanda purana. Hampi, or ‘Pampa’ as it was known centuries ago, stands on the southern bank of river Tungabhadra in Hospet taluk of Bellary district of Karnataka. A World Heritage centre, Hampi, is the most beautiful and captivating of all ruins in Karnataka. It is full of delightful surprises comprising of ancient temples and monuments. According to legendary history and local traditions, there was a prosperous town on the present site of Hampi many centuries ago, before the Vijayanagara Kings selected it for their capital. Some of the dramatic scenes in the great epic Ramayana occurred at a place called Kidskins and it is believed that this Kishkinda was close to Hampi. In those early days, the place was ruled by the two brothers of the monkey race, Vali and Sugriva. On the banks of the river Pampa, the present Tungabhadra, was the hermitage of sage Matanga on the hill called Matanga Parvatha. Vijayanagara is remembered today as the Golden age of Karnataka where famous poets graced the court of Krishna Deva Raya. Vijayanagar, the ‘City of Victory’, was the greatest of all medieval Hindu capitals, the seat of an empire that extended from the Arabian sea to the Bay of Bengal, and from the Deccan plateau to the tip of Indian ocean. The majesty of huge tumbled boulders, the silent rivers, isolation, solitude and wild nature must have naturally attracted a number of sages and ascetics to this spot. Sage Vidyaranya or Madhava also used the place for his meditation. Deriving inspiration from this celebrated philosopher and sage Vidyaranya, Harihara and Bukka, two of the five sons of Sangama, founded the kingdom of Vijayanagara in 1336 A.D. They named it after their Guru Vidyaranya and made Pampapati or Virupaksha as their patron deity and family god. Some historians are of the view that the city was founded by the Hoysala king Vira Ballala in the middle of the 14th century. Vijayanagara very rapidly came to dominate South India. After the period of disruption caused by the Muslim invaders, it was the ideal moment for the formation of a new ruling house. Vijayanagara was founded in an attempt to establish a new moral and social order based on traditional Hindu cultural values in a good environment. For more than two hundred years, the Vijayanagara rulers fought to attain supremacy against rival Muslim Sultans and other Hindu kings. While I be Vijayanagara emperors fostered the development of intellectual pursuits in the arts, music, literature, architecture, sculpture, etc., they also introduced new I echniques in welfare, building, water works and agriculture. On the banks of the river Tungabhadra are boulders of fantastic shapes and sizes. Using these and granite from the (I uarries, the Vijayanagara kings erected the buildings in their capital city, imbuing them with the spirit of their martial prowess and their exultant victorious temper, which distinguishes their name as ‘Vijayanagara’. The style of architecture is an admixture of Muslim and Hindu art – what is known as the Indo-Sarcenic style. In fact, the kings had employed many skilled Muslim craftsmen for construction work. Vijayanagara had many ups and downs. At one time, Ahmed Shah, a Bahmani Sultan of Gulbarga sacked Vijayanagara city massacring women and children. It was only during the reign of Krishna Deva Raya, between 1509 and 1529 A.D., that Vijayanagara reached the zenith of its power when the kingdom was extended to Kanyakumari in l lie south, to Cuttack in the east and Salsette in the west. Leading his armies against Ismail Adil Shah, the Sultan of Bijapur, in 1520 A.D., Krishna Deva Raya took the fortress of Raichur. The king was an artist, a poet and patron of Sanskrit and Telugu literature. He had divided his empire 1 nto a number of provinces, each looked after by a Governor. Many stately buildings, temples, aqueducts and major irrigation channels were constructed in his day which have survived the ravages of time. Though after Krishna Deva Raya a weak ruler suceeded him, his brother Achyuta Raya and the next ruler Sadashiva Raya under the guidance of his famous minister, Rama Raya vanquished south Indian kings of Kamboja, Bhoja, Kalinga and Karahata and proved a major opposition to the Muslim states of Bijapur, Golconda, Ahmednagar and Bidar. These Muslim states finally decided to put an end to the Vijayanagara kingdom and their combined armies swept on towards the famous city. Rama Raya though very old at that time led the main central division of his army. It was at the fortress of Talikota near the river Krishna where the two armies clashed on January 23,1565- The Muslim army had many guns and broke through the enemy. Rama Raya tried to escape but was taken prisoner and later beheaded. Next day the city was pillaged by bands of wandering gypsies and when the victorious Muslims entered the city, they completed the destruction. Never perhaps in the history of the world has such havoc been wrought, and wrought suddenly, on so splendid a city; teeming with a wealthy and industrious population in the full plentitude of prosperity one day, and on the next seized, pillaged and reduced to ruins, amid scenes of savage massacre and horrors beggaring description. Yet, the glory that lives today in the ruins at Hampi speaks volumes in stone of the splendour and magnificence that surrounded the mighty kingdom of Vijayanagara. Over a vast area the ruins hemmed in by an untamed jungle and the barren desolation of the rocky granite countryside. Originally, the city of Vijayanagara was surrounded by protective fortress walls and five huge gates. Of the monuments of the sacred centre, the temples on Hemakuta hill south of the village Hampi are the oldest. The hill too was fortified by the kings, and was possibly their first seat of power. The temples, however, belong to an earlier period, and date back even to the ninth and tenth centuries. In fact, the monuments testily to the antiquity of Vijayanagara as a sacred place linked with the worship of Virupaksha. The cults of Pampa, an indigenous goddess identified with the Tungabhadra river, and of her consort, Virupaksha, an aspect of Shiva, appear to have existed at the site well before the establishment of the Vijayanagara capital. Even after the destruction of the city, the cults still live on. Today, l he Virupaksha temple is the only great sacred complex at Vijayanagara still in worship. Chariot festivals held here annually are attended by thousands of pilgrims. The temple of Pampapati, dedicated to Virupaksha who was the dynamic deity of the kings of Vijayanagara contains a (lyramidal tower which is probably one of the largest steeples to be found in temple architecture in India. The staircase to reach the top of this tower has been built into the stone work. The layout of the Virupaksha temple testifies to its growth over many centuries. At the heart of the complex, and also grouped around a tank to the north, are several minor shrines, dating back to Chalukya and Hoysala periods. These, however, are completely engulfed by Vijayanagara extensions. The complex consists of two main courts, each entered through a towered gateway. The largest gateway is on the east, and was enlarged in 1512 A.D., at the order of Krishna Deva Raya himself; it attains a height of more than 50 metres. Of interest in the temple is the hall leading up to the principal sanctuary. Here, finely carved columns with rearing animals are found; the ceiling is painted with scenes from the mythology of Shiva. Among the ruins is the splendid temple of Vittala, construction work on which was begun during the reign of Krishna Deva Raya, but which remained an unfinished symphony in stone. Even in its ruined condition, this old temple represents the highest achievement of Vijayanagara art. The chariot of Vittala is carved out of a single block of stone and the massive chariot wheels can revolve round on their axles. The temple stands on a richly carved plinth and the pillars which support the roof are exquisitely sculptured. Depicting the episodes from the Ramayana on its walls stands the temple of Hazara Rama. This temple functioned as the State chapel for the ruler. Four carved pillars of polished black granite stone hold up the roof. Because of the stories of hidden treasure beneath this temple were circulated, gullible people have from time to time ripped up the flooring which has many underground passages. No one knows what purpose it served in the past. The eleven domed structure still is in a good condition at a little distance from the temple is known as the Elephant Stables, where elephants used on ceremonial state occasions were stabled. Also near the stables are the remains of a concert hall and the council hall. A vast water trough, like an aqueduct, the remains of what was most probably the bath l or the ladies of the Court, and a statue of Shiva are also some of the remains which are worth the mention. Imnting scenes and graceful dancers. It was built by Krishna I )eva Raya to commemorate his victory over the king of Orissa in 1513 A.D. The Krishnaswamy temple, now in a badly damaged state was inaugurated in 1513 A.D., with the installation of a Bala Krishna idol. Unusual is the Islamic styled granary in I he south court. South of Hampi and Hemakuta hill are two structures sheltering boulders carved with Ganesha figures. One of these is enclosed in a temple with unusually tall columns; the other example stands within an open hall. (‘arved out of a single block of granite is a grotesquely shaped awe-inspiring gigantic idol of Narasimha, with its gargoylelike features and protruding eyes. A carving of the Shesha Naga acts as a canopy to the statue. 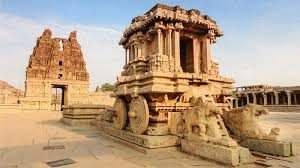 The villages spread along the road leading from Hampi lo the town of Hospet contain temples and other remains from the Vijayanagara period. Such monuments testify to l he vast extent of Vijayanagara capital. East of Kamalapuram is the Pattabhirama temple, one of the most impressive of all the 16th century complexes. The towered gateway is complete in all its ascending storeys. The ruins of Hampi can make your imagination run riot. In these surroundings there was a cultural efflorescence, when musicians, artists and artisans gathered to create poetry and fulfil the grand vision of their kings. What is left over of the Hampi ruins is evocative of what it must have been, the pomp and glory which brought thousands of visitors from across the seas to marvel and write many books about it. Hampi can be reached from Hospet Rail station on the Guntakal – Hubli line. It is 62 kms. from Bellary and a tourist can drive in his own car to Hampi or get a taxi. There is a modern guest house at Hospet very near Hampi for the use of visitors. Excellent lodging hotels are available at Hospet. Taxis and guides can be arranged from here to take the visitors round the Hampi temples.